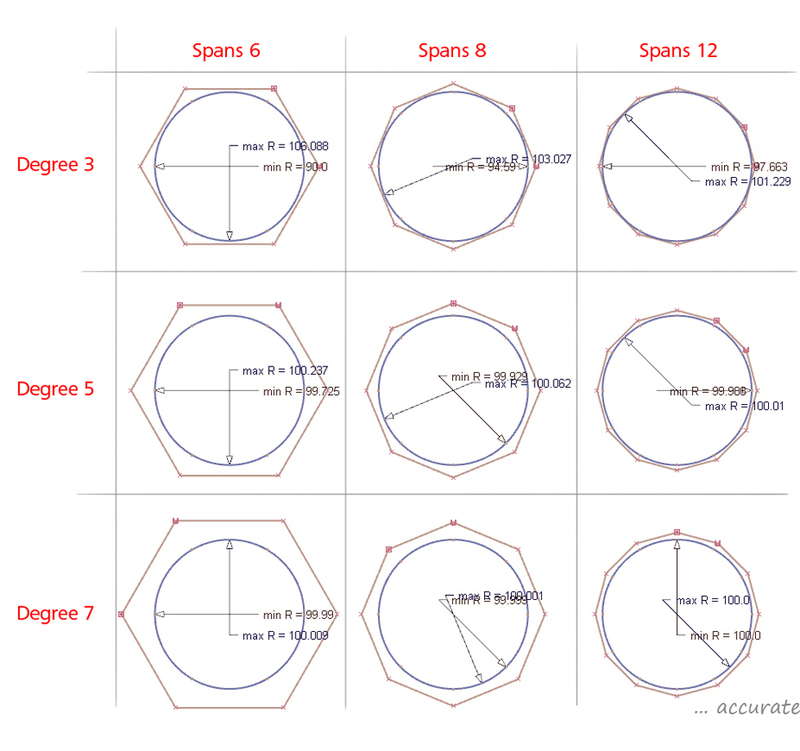 Accurate: Consistent radius value at every point on the circle. Freeform: A closed loop with a freely varying radius along the curve. The different settings for circles are summarised below, and discussed in detail in the following sections. The 'R' in NURBS stands for 'Rational', and we can choose to work with either Rational or Non-Rational geometry, by changing the settings in the Construction Options. Non-Rational applies an equal weighting (value 1) to each CV. Non-Rational is preferred for most geometry as the CVs behave in a predictable way and have the same influence on a curve or surface. However it is difficult to get accurate circles with Non-Rational. Rational allows different weightings on each CV. This makes for more complex geometry but it reliably creates dimensionally accurate circles. 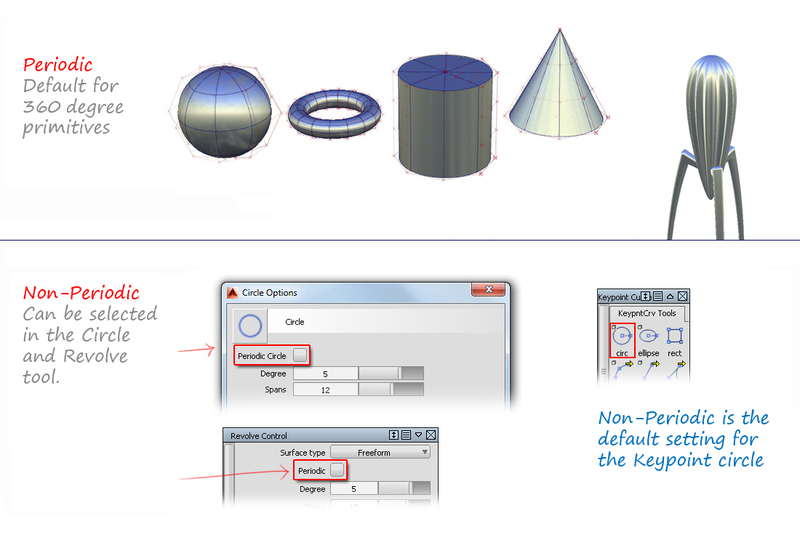 Select Rational geometry in the Construction Options before creating circles or revolves, to ensure dimensional accuracy. Be careful with this setting, and turn it off after you have created the accurate circle or revolve. The CV layout that results cannot be successfully sculpted, and sometimes causes strange results when used in, for example, offsetting. Within the category of Non-Rational geometry, there is another setting, 'Periodic' which also affects circles. When creating circles with different tools, you may notice different CV layouts. This difference can be explained by understanding the difference between 'Periodic' and 'Non-Periodic' geometry. There is a difference between 'open' and 'closed' curves. An open curve (non-periodic) has free ends. A periodic curve is joined or 'closed' to form a loop. It is similar to the idea of overlapping ends, but is not an exact analogy. Periodic geometry keeps the CVs evenly and symmetrically distributed, which keeps the curve as a smooth circle or loop shape, regardless of which CVs you move. If you select 360 degrees for primitive geometry, it will typically default to a Periodic setting. In some tools however, there is an option to choose Non-Periodic. Each CV has the same effect on the circle, and there is no visible 'join'. This means you can sculpt the circles symmetrically and/or smoothly. 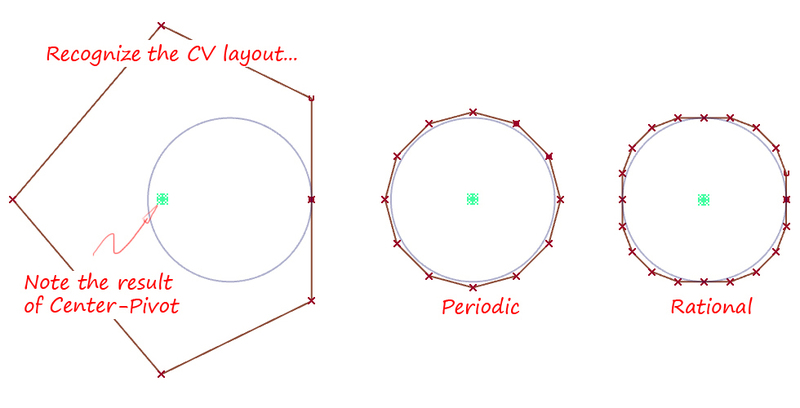 These examples have been created by moving CVs on a periodic circle. Non-rational, periodic circles aren't perfectly circular. It is possible to get a very accurate result with a 90 degree quarter-circle, if you choose degree 6 or higher. You may notice an anomaly with periodic circles. Only one CV can be selected in each CV position, but in some locations two CVs appear in the Information Window. This has no effect on your modelling and is just a characteristic of the 'overlapping' that is used to create the loop. Each CV will behave the same, and you can ignore the 'double CV' display in the Information Window. Object Edit → Detach (but you will need to detach twice). Most users now prefer to create four accurate, 90 degree segments (using degree 6, single-span), instead of using rational geometry. 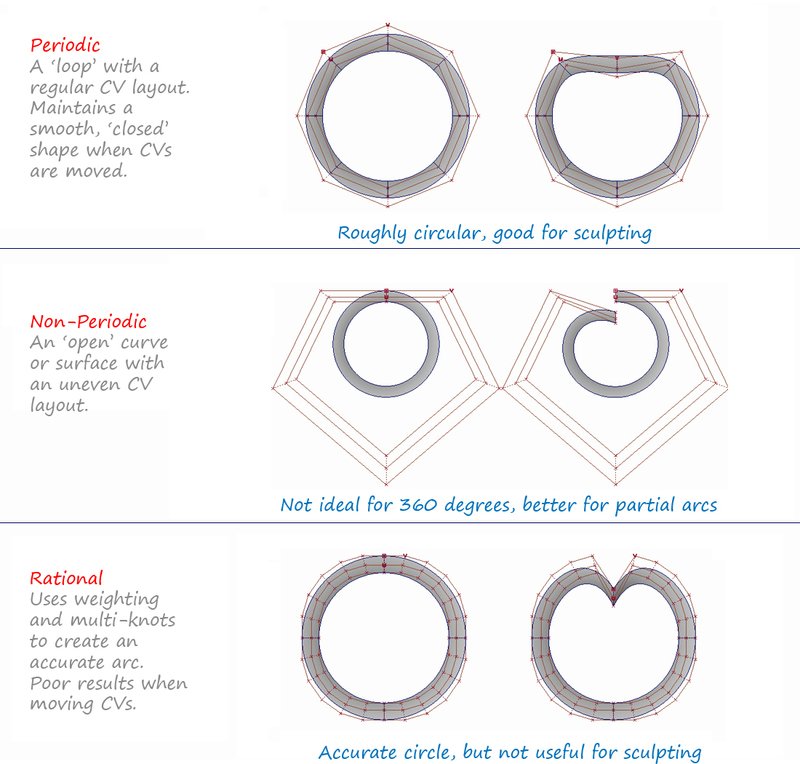 Experienced users learn to recognise the different CV layouts that you get with the Periodic and Rational settings, and so avoid using the wrong geometry. The key to this is to always display the CVs for a new circular curve or surface that you build, to check the CV structure. 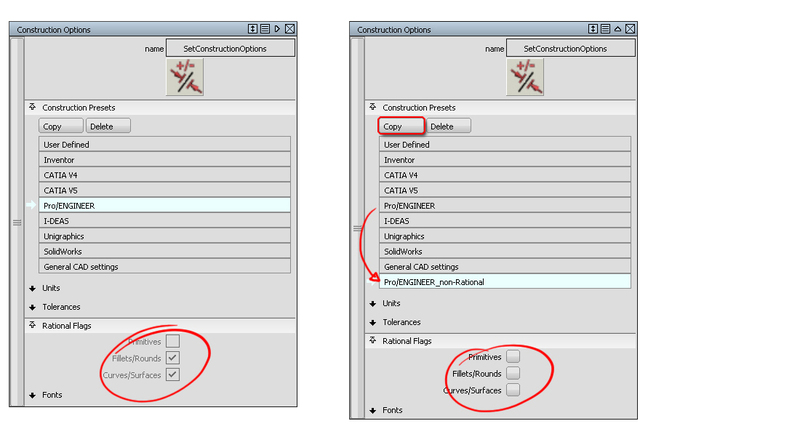 If you are using one of the construction pre-sets that has a Rational flag on, then you may want to copy the pre-set and set the flags to off, so that you don't get rational geometry by mistake. Object Edit → Align won't work with Periodic surfaces. (Use Align2008 instead). Offsetting a Rational Surface will cause the offset surface to break into quarters.